Sean, you are right on on many accounts. This is a second chance, and let's hope players, domestic and foreign, take full advantage. I am less optimistic. I remember students in Osh asking me, in 2005, “What do you think of our Revolution.” I told them the story of Ben Franklin, who, when asked, “What do we have a republic or a monarchy?” replied, “A republic, if you can keep it.” At the time, replacing Akaev with Bakiev, a former Soviet apparatchik, was not encouraging. You point, correctly, to the patron-client system. I think it is more deeply ingrained than you do. Nancy Lubin’s work shows that the graft system (I think “corruption” is too value-laden for reasons I’ll mention below) pre-existed the collapse of the Soviet Union. I learned that one’s duty to provide for family, clan, and tribe through graft trumped every consideration of commonwealth or good government. Graft in Kyrgyzstan is so broad and so deep that it is better understood as an economic system. That is not to say that some Kyrgyz citizens do not recognize the problem of tribalism. Some do. Those I know who recognize the problem tend to be no older than their early-40s. (On the other hand, many who benefitted from the system come from this younger generation.) Edil Baisalov, for example, recognizes the problem. Others of his generation recognize it but have no reason to change it. Right now there is not a critical mass of Edils to make a difference. The opposition that comes out of the Bakiev regime offers me no hope for reform. Remember, we heard the same promises and protestations in 2005. 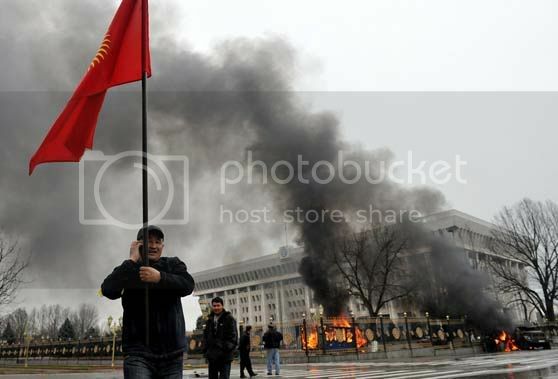 That Spring, amidst the tulips and the roses, Kyrgyzstan briefly had a republic. They simply couldn’t keep it. Certainly the USG should come out forcefully in recognizing that the failings and corruption of the Bakiev government led to widespread dissatisfaction in the country and that it will support vigorously attempts by Otunbaeva and others to rebuild the state and forge a more responsive government that serves the greater public good. There are huge challenges that she and others will face and support is called for. The USG was painted, not without some cause, as being supportive of the Bakiev govt. as long as it kept its rights to Manas airport. This is partly due to information wars from certain media and 'pundits' associated with competitors to the US, but also how the US projected what its interests were in the country. There were mil-mil things, but relatively little prominent public engagement with civil society and the political classes, including opposition, particularly in the last year and a half when question arose over Manas. It was widely interpreted that the USG just wasn't interested in Kyrgyzstan for the country's sake -- the only care was for its airfield. Air Force Band "Reserve Generation" performed in the Kyrgyz Republic from March 5 to March 12 with support from the Transit Center at Manas and the U.S. Embassy in Kyrgyzstan. While hardly a researched assessment of USG's engagement, it does reflect the interests that the USG was projecting. Dealing w/ corruption and governance will, like almost everywhere, take a long amount of time. Need to start addressing it by reducing opportunities to the extent possible and reverse the grand corruption that was occuring, but there are other immediate issues to shore up the State and garner some stability without going the authoritarian route. Yes, it is deja vu. I fear that Kyrgyzstan will continue to experience deja vu, because Bakiev once he took office wanted to engage in radical changes. Roza seems like a genuine woman with genuine intentions. I hope Roza holds transparent and fair elections once things have settled and just doesn't claim the office as her own. I think Bakiev will reappear once things calm down and that his son will run for election just like Akaev daughter tried to do. Question for all of you: Where is Maksim Bakiev? There are rumors that he is in Washington DC, New York City, and in Jalal-Abad with his brother. If Kurmanbek is in Osh, shouldn't his sons be with him? Speed studying methods began numerous years in the past, largely with the support of various machines that had been employed to boost the sum of images noticed by the procustomwriting individual. Use of these machines was a well-known pattern in the 1940's, however it was only afterwards on that strategies were discovered which had lasting outcomes on pace reading improvement.